In April 2011, we saw one of the worst tornado outbreaks ever in the Southeast. On April 27th alone, there were 208 tornadoes with four being EF5’s tearing across hundreds of miles of the countryside, killing hundreds of people and destroying hundreds of millions of dollars in property across six states. This was the catalyst (amongst other things) to build a storm/ shelter/root cellar/bunker. This is not the easiest way or maybe the best way to build a shelter, but it worked well for me and my budget. First I live in a region of the country where I have hills to dig into. So I choose a location near the house, not too far away, in close running distance. I dug out (with my tractor) a twenty-foot wide swatch and twenty-foot back into the side of the mountain. I left the bottom of the hole about eighteen inches above the valley ground level, that is in front of the hole. This will help keep any water flowing into the valley, out of the structure area. To also help aid in water drainage, I cut a shovel wide trench above the structure area, so water coming from the ridge above is diverted away. Digging around the perimeter of my newly dug hole, where the “survival shelter” was to be built, I added a French drain. A French drain is basically a shallow trench with 6” septic drainage pipe, with holes on the top that allows the water to flow down and out. A nylon sock encompassed the pipe to keep debris and dirt out of it. This trench was dug where with a downgraded outflow. This French drain will direct water away from the structure and down into the valley. I then added about 8 inches of rock over the drain and in the area where the shelter was to be placed. This again allows for better drainage of water from under and around the structure. 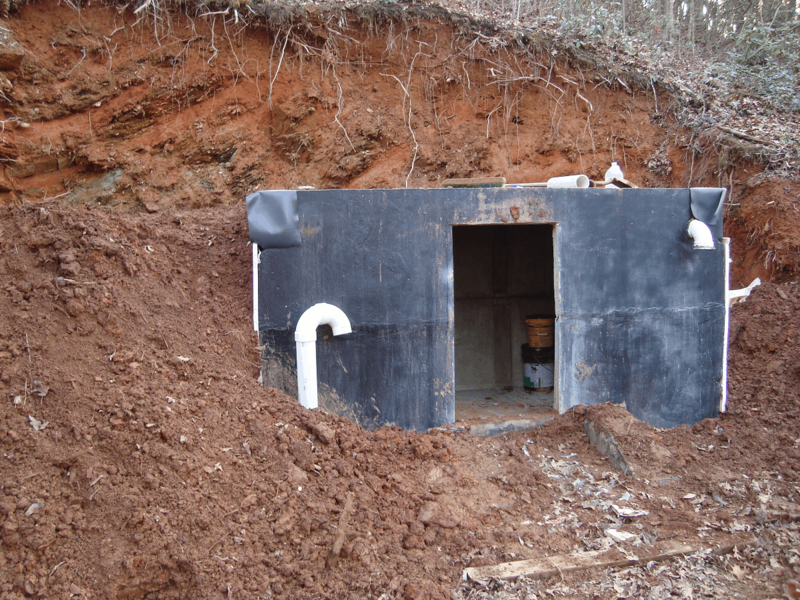 I contacted a local concrete septic tank builder and explained what I was doing. With a few pencil sketches of my shelter, he was able to add extra reinforcement steel where needed and vent holes for incoming and outgoing air. He placed a four-inch vent hole at the bottom the left front corner for incoming air and one at the top right front corner for outgoing air. He also took the time to Dam Tight the bottom of the tank for me at no extra charge. The 10 foot by 6 foot by 6 foot high, 1500 gallon tank cost $750. delivered in place. The tank came in two pieces and weighed a total of twelve thousand pounds. The halves pieced together with a V groove and some thick rubber sticky material that acted as a seal all the way around. I added hydraulic cement on the seam to help waterproof it a bit more. Before I cut the doorway, I put two coats of Dam Tight and three coats of rubber roofing material on four sides and the rooftop. I rented a concrete saw, and then cut a doorway into the structure, leaving the bottom of the door four inches above the shelter floor. Again helping keep any water from coming in. The thickness of the tank is four inches, with rebar and wire throughout the structure. “A car could drive over this structure with no problem”, according to the maker. Not that we are going to try it, but adding dirt to the roof does add weight so this was a bit reassuring. Building the door took a little planning. I utilized four-foot by eight foot, 1/8” thick steel plates that would rise two feet above the roof line. The steel door hole cut would be 1 inch bigger all the way around than the hole cut into the concrete structure. This way when the door closes, it will have a tight rubber seal to close on. I considered using a ¼ inch steel plate, but the weight would have been twice the 1/8 inch steel which still weighs 300 pounds or better. The inside lock has not been welded but will be done near the end of the project. There is an outside door lock welded on already. The door will be Red Headed to the concrete structure. Before backfilling, I added pink foam for a little insulation on the back and sides with Liquid Nails. Now the backfilling begins. At the point, I took the pictures, with the back and sides being filled in. Once the door is in place I will place 4-inch by 4 inch PT posts stacked upright behind the door, on the roof, so the dirt has a place to stop. That is why the door is two feet higher than the roofline. The dirt on top of the roof will be approximately four foot deep on the back side and two foot on the front side to keep the slope of the ridge the way it was. Of course, these 4 x 4 posts will be nailed, screwed and glued together as this holding wall is built. By the deadline of this article, I really don’t know if this structure will be complete, due to rain, snow and the cold, but I will entail the rest of my plans like I just did. Before backfilling the roof, it will have insulation, plastic material plus roofing material that will help keep water off the roof and direct it one foot or better past the sides of the shelter. This will be in place before I backfill the roof area. Backfilling the space above the roof and behind the structure will take nearly 83 cubic yards of dirt. I guess I made the hole a bit bigger than I really needed. Small oversight I’m sure you can correct! With the door in place and the 4 x 4 lumber on, and the roof backfilled, now comes the front of the structure. I will do the same type retaining wall (as on the roof) on the sides of the door. I choose the same wood, 4-inch by 4 inch PT posts that will stack upright and go six feet out from the structure. These wood retaining walls will be on each side of the door, attached to the door and will hold dirt that will be covering up the front of the structure. Utilizing the septic manufacturer again, he pours these two foot by two foot by four-foot wide concrete reinforcement blocks that weigh one ton each. I plan on stacking this four-foot out away from the structure. These will be stacked three high, making a six-foot high wall in front of my structure. Sure this is overkill, but that is my middle name! After these blocks snug up against my 4 by 4 wood retaining walls alongside the doors, I will backfill that area with dirt. This will give me a 2-foot thick concrete barrier with 4 feet of dirt in front of my structure. Of course, I will paint the concrete blocks to match the surrounding foliage. When this is complete I will grow grass and ivy on the roof area to help keep the soil in place and blend and bushes in the front to hide it. Now for the inside, I choose a thin layer of insulation for the ceiling and walls. This will keep the echoes down inside plus keep from getting a knot on the head when I stand up! For the floor, I like the industrial rubber floor mats, as the dirt falls below the mat through the holes. As for the ventilation, I am exploring several options with no decision made yet. Of course, by now, I have all the necessary survival food, gear and tools in place and ready to move in. So we don’t get a tornado…we don’t have a mass extinction event…now I have a great root cellar and a fort for my 5-year-old to play in. All in all, it costs about $2000 and some diesel fuel for my tractor to build. Not bad…for an old country boy in the mountains! Check out this video for more awesome underground bunker ideas! Next story How Many Acres Do You Need for a Small Farm? Previous story What’s The Best Extreme Cold Weather Clothing?